Ms. Gaby grew up in the beautiful beach community of Malibu, California. After graduating from California State University Los Angeles with a Bachelors Degree in Liberal Studies, she went to Humboldt State University to complete her Special Education Teaching Credential. Although it was hard to leave behind the North Coast’s ancient redwood trees and banana slugs, Ms. Gaby missed her family, friends and the sunshine of Southern California. 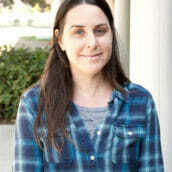 She spent the next five years in the Los Angeles area teaching art to students of all ages with learning disabilities. Since moving to Orange County two years ago, Ms. Gaby taught art to elementary and middle school students through workshops and after school programs. She loves to teach ceramics, handwork, printmaking and collage through her business, The Clay Rainbow. She is most inspired by the beauty found in nature as well as art from around the world and shares this with her students. Ceramics is by far her favorite artistic medium to work with and to teach because it inspires new ways of thinking, teaches problem solving, builds confidence, and it’s really fun. In her free time Ms. Gaby likes to make things, spend time with her husband, her cats, her friends and her family. She also loves to cook vegetarian delicacies and go camping. Ms. Gaby has an appreciation for all things old-timey and loves to watch silent movies and listen to music on her phonograph from the 1920’s.